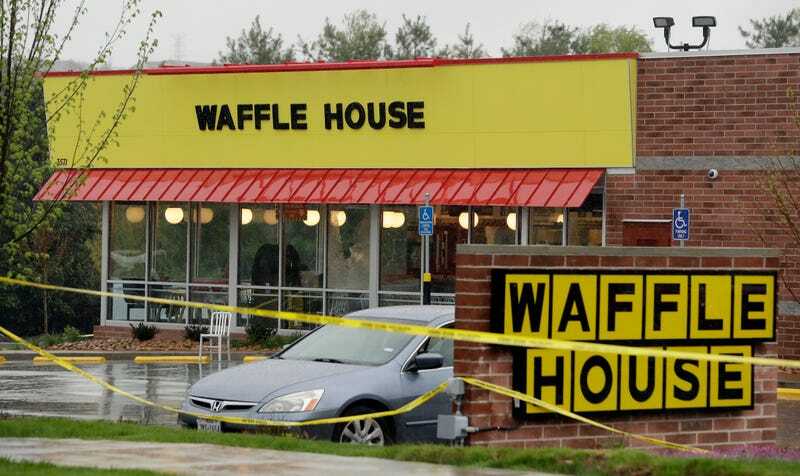 Police tape blocks off a Waffle House in Antioch, Tenn., outside Nashville on April 22, 2018, where four people died after a gunman opened fire at the restaurant. Two separate GoFundMe campaigns, one raised to benefit the victims of the Waffle House shooting in Antioch, Tenn., and one started to benefit James Shaw Jr., the hero who wrestled the gun away from the suspected shooter, have both raised more than $100,000 in a span of mere hours. In the aftermath of the shooting, Shaw, an electrician and the father of a 4-year-old daughter, decided that he wasn’t done giving back to his community, even after risking his life, so he launched a GoFundMe campaign to benefit the victims of the shooting. In a mere 12 hours, the campaign accumulated $13,814 of its $15,000 goal. As of Wednesday morning, only two days after it was started, that campaign had collected $131,886. Click here to support Victims Of Waffle House Shooting organized by James Shaw Jr. But even as Shaw was determined to go back, there were others who wouldn’t let the humble hero shy away from the spotlight. Despite his fearless actions, Shaw told reporters that he was only trying to survive. His community, however, has firmly labeled him a hero, and reporter Yashar Ali decided to step in, starting his own GoFundMe solely to benefit Shaw. “James Shaw Jr. put his life on the line when he took on the gunman who killed four people at a Nashville area Waffle House. Since that horrific shooting, he has raised tens of thousands of dollars for the victims and shown a level of humility that has inspired many of us,” Ali wrote in the description. That campaign raced toward $121,916 within 24 hours, just about $3,000 shy of its $125,000 goal. In the meantime, Waffle House is also lending its support, offering to pay for the funerals of the four customers—Akilah Dasilva, 23; DeEbony Groves, 21; Joe R. Perez, 20; and Taurean C. Sanderlin, 29—who were killed in the gunman’s rampage. The restaurant chain has also offered to cover the medical costs of those injured.